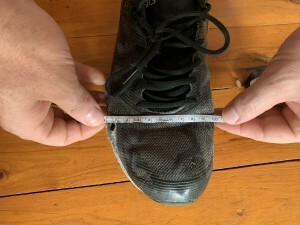 When I assess foot and ankle problems I will typically have a look at the client’s shoes and I’ve been noticing a lot of people hanging over the soles of their shoes saying that they can never find a shoe wide enough. 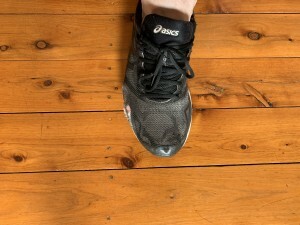 Physio / Coach Chris has experienced this most of his life and even in the wider Asics (if you didn’t know, Asics have a 2E and 4E shoe to cater for the wider foot without making the shoe too long that you slide backwards and forwards in it) don’t cut it over time (see picture of Chris’s toe having broken out of the Asics 2E in < 9 months – and that wasn’t really even from regular running, just day to day use). So last year Sara came across the brand Vivo Barefoot and I thought it would be a good time to test it out so I got Chris a pair for Christmas. 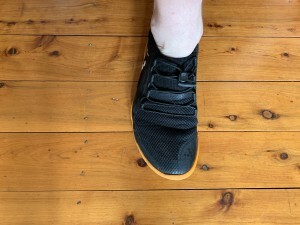 The Vivo Barefoot is designed with a wider forefoot so that the toes and forefoot can splay like they’re ment to when you walk rather then get scrunched up in the shoe. 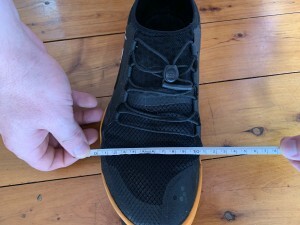 The shoe then tapers inwards towards the heel. The foot is the body’s base of support and was designed to have a natural spring. When the foot is ‘unloaded’ the deep muscles and ligaments of the foot create arch support, then when you ‘load’ your foot the arch collapses and the ligaments, muscles and tendons provide an elastic recoil to create the ‘spring in your step’. Our arches and ankles are designed to absorb 52% of shock (when the correct technique is used) however padded joggers take away our ability to sense the ground and use what we were naturally built with. 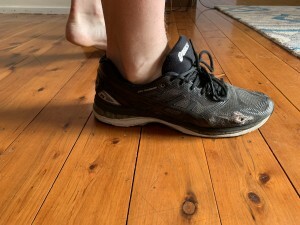 It’s strange to think that all this new ‘technology’ in shoes being designed for high arched feet or pronators to support and cushion our load is more then likely just weakening muscles in our foot and causing injuries because we never actually learn to use our intrinsic or deep foot muscles. But time and time again we have people presenting with ankle, knee and hip issues who don’t know how to dome their toes or where their big toe (the main lever to push off when we walk) doesn’t even touch the ground to walk or balance and they often come in in shoes where the toe box tapers inwards to a point (mostly because of what fashion dictates). Even Chris started out sounding like he was walking in flippers because this was the first time he’d had a shoe where his toes could spread and he wasn’t hanging over the edge of the sole. He had to re-learn how to sense the ground again. (The Vivo’s are a good 1cm wider at the metatarsals and the material is flexible enough to handle the splay of the toes when weight bearing). 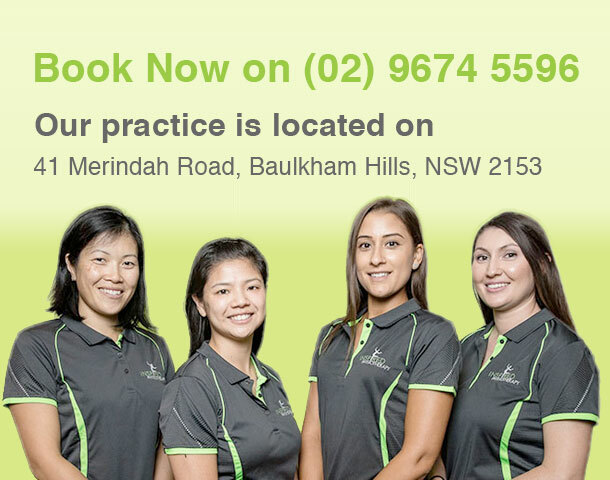 Overall the philosophy of Vivo Barefoot makes a lot of sense – especially being a dance physio where we don’t have the luxury of being able to wear an orthotic in a jazz shoe or ballet slipper and end up learning to use our feet the way they were designed to be used. It’s time to translate this philosophy to our runners and everyday walkers.